I\’ve spent 150+ hours playing this game. I beat it 4 times. Why? Because it’s so addictively fun, and it’s hard to stop playing. Paper Mario follows the same basic plot as all Mario games. Bowser kidnaps Peach. Mario rescue Peach and defeats Bowser. 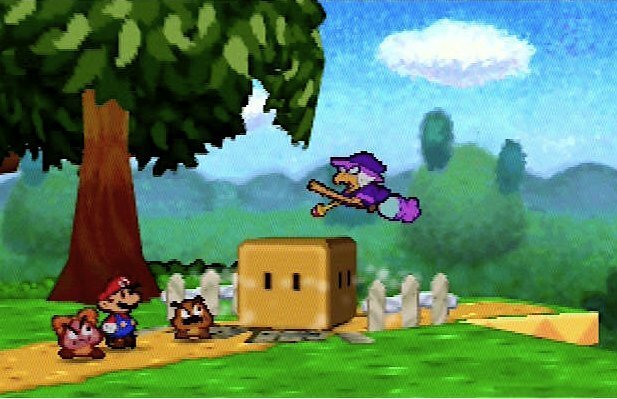 While staying with the basic plot Paper Mario is a slight variation. In the very beginning of the game you see a story (from a book) about the star spirits and the star rod. The star rod has the power to grant wishes to anyone. The star spirits have used it to keep peace and harmony throughout the lands. As the story continues, you see Bowser stick into the book a magikoopa, who proceeds to steal the star rod. Bowser makes himself invincible, then goes to Peach?s castle and suspends it in space. He also imprisoned all the star spirits through the lands and placed guardians over them. Your task is to collect all of them and use the combined power the overthrow Bowser, save Peach, and restore peace and harmony to the world. While not a new plot, it feels like a true Mario game. Really, doesn’t everyone wish they were a plumber who saves the world, again and again? In Paper Mario you have three major stats that govern your abilities, Heart points, Flower points, and Badge points. Heart points are your health, Flower points are used for special battle moves, and badge points are used for putting on badges. Mario has two basic attack moves, Jump, and Hammer. Mario can equip different badges for variations of these moves. In addition to Jump and Hammer attacks, you receive star moves every time you rescue a star spirit. During the game, when you defeat an opponent you receive star points. When you collect 100 star points you level-up Mario. When you level-up Mario you can choose one of his three stats to upgrade. If you upgrade heart points, you may not have enough attack to finish off enemies. If you upgrade your flower points, you may not have enough health, and you may not have a lot badges to use your flower points. If you upgrade badge points, you may not have enough health, and you may not have enough flower points to use you badge moves. Simplistic, yet complex enough the system works incredibly well for this game. Also you can purchase items. Items work to both restore heath and to use in battle. In the game there is a cooking system (with the lovely Taste T.) that allows you to make special item. Overall a well-designed system, that is easy to learn and hard to master. You don’t really notice the sound in the game. It blends into the game seamlessly. The music is classic Mario, and gives the game a true Mario feels. Battle sound effects are well done and add to each battle. They can be changed with a sound fx badge for custom battle sounds. Well-done sound, which adds to the game. Absolutely gorgeous graphics. The best I\’ve seen for the 64. I can’t see how they could be better. The world is storybook like, and cute looking. Very detailed environments. Each town feels like a place in a real world. The graphics bring you into the story and make you feel a part of it. A very family friendly game. Probably the most clean RPG game. The only slight issue is the talk of the star spirits. The spirits grant wishes and keep the world in order. Also there are magicians that can cast a spell on you to make you better in battle. However these aren’t dwelled upon very much. Overall probably the best game for the 64.